*Dolores Kerman flipped the ignition switch and MOLE-1 lumbered off the pad, its solid boosters struggling against the force of gravity. In time, the boosters gave way to the Titan core stage, powered by twin Fulcrum engines. A few minutes and stages later, the Mark One Laboratory Extension achieved orbit. With orbital rendezvous and docking still in R&D, MOLE-1 was part spacecraft and part space station. Once their orbital tasks were complete, Dolores and Isaxy- the scientist sitting in the Mk-1 pod's "Backseat" extension- would deorbit the combined spacecraft and ditch the station elements before re-entry. Fixed overchange of Equipment costs for OmniConverter templates. Fixed incorrect display of Equipment costs in the Operations Manager. Fixed duplicate OmniConverter and OmniStorage loadouts that happen when you revert a flight back to the editor and create a new part. Fixed Botany Module's Classic Stock resource requirements - Thanks JadeOfMaar! Updated plume effects - Thanks JadeOfMaar! Fixed propellant issues with the Fulcrum, Corvette, and Hemi Cuda. Corvette and Hemi Cuda's Raptalox mode moved to Classic Stock only. Removed Proplox propellant option for Corvette and Hemi Cuda. Fixed issues with interstage adapter nodes. Removed duplicate Play Mode patches. Fixed issue with experiment manifests not remembering what experiments you loaded in after you revert your flights. Last release for KSP 1.4.5! Bug Fixes & Enhancements - Fixed issue where switching Play Modes would cause some files to not be renamed and cause all kinds of fun for players... NOTE: For the changes to take effect, you'll need to switch your Play Mode to some mode other than the current one, then switch it to the desired mode. Omni Converters & Storage - Added search functions to OmniStorage and OmniConverter GUI. - Play Mode now lists which mods support a particular mode. Classic Stock - Added new Classic Stock omni converters: Propellium Distiller, Oxium Distiller, Snack Grinder (requres Snacks), Soil Dehydrator (requires Snacks). - MOLE, MOH, and BOW all default to Omni templates. - Fixes Play Mode failing to rename certain files. NOTE: You might need to reset your current play mode. Simply open the WBT app from the Space Center, choose another mode, press OK, and again open the app, selecting your original play mode. Then be sure to restart KSP. Fixes Play Mode failing to rename certain files. NOTE: You might need to reset your current play mode. Simply open the WBT app from the Space Center, choose another mode, press OK, and again open the app, selecting your original play mode. Then be sure to restart KSP. Fixed click-through issues with windows displayed in the editor. Updated support for Extraplanetary Launchpads. WBT, KerbalActuators, and Classic Stock resources update. WBT and BARIS bridge update. Improved resource summary in the geology lab. Fixed a situation where resource distribution that wouldn't distribute resources. Adjusted Classic Stock resource densities to reflect the 5-liter standard used by most stock resources. Adjusted Classic Stock storage capacities to reflect the 5-liter standard used by most stock resources. These changes will affect new parts and when you reconfigure an existing part. Classic Stock is now the default Play Mode for new installs of WBI mods. Existing games are unchanged. The last major parts update to MOLE introduces some new items to round out the 1.875m station parts including a cupola and a programmable station arm. New Parts - Mk1 Cupola (Space Exploration): This 1.875m cupola provides excellent views and can double as an airlock. - Mk1 Station Arm (Advanced Construction): This arm can be use to maneuver payloads around in orbit. Bug Fixes & Enhancements - Re-textured the Titan tanks to bring them up to DSEV standards. Bug Fixes & Enhancements - Recompiled for KSP 1.4.1 - Optimized several meshes to help improve rendering rates. 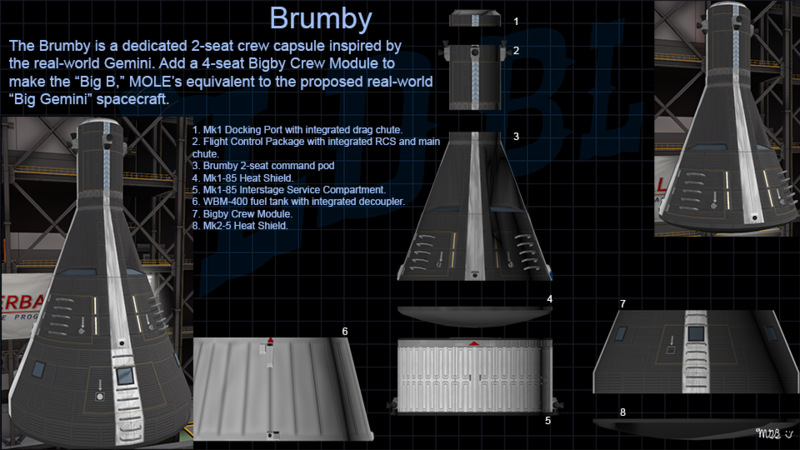 - Lightened the Brumby capsule's dry mass to make it comparable to the DLC mk2. - The Brumby can now carry two science experiments. - The Bigby Crew Module can now carry four science experiments. - Removed helmet requirements in the Appaloosa, Brumby, and Bigby Crew Module to remain consistent with stock command pods. - Fixed MOBL crew spaces. - Fixed several part descriptions. Experiments - Added new Breakthrough Research experiment. It has a small chance of creating an experimental version of a part that's located in an unresearched tech node. The experimental part is fully functional, just like those that you get with part test contracts. You have a chance to create an experimental part even after the Breakthrough Research experiment stops producing Science. OSE Workshop now functions properly for the Mark One Habitat when you install both OSE Workshop and Pathfinder. WBT update NOTE: This is the last update of MOLE for KSP 1.3.1. IA-25: Leveled the central attachment node with the rest of the engines. MOLE: Reworked the IVA to be horizontal like the the MOH and MOBL. New Contract - Touring: This contract requires you to send 1 or more tourists to a specific vessel and return them home safely after a few days stay. All docking ports now have configurable lights. They'll automatically switch on when you set them as your docking target. New Parts - Bigby Decoupler (Specialized Construction): This expensive Size 3 decoupler was built to help launch the Bigby Orbital Workshop. - Bigby Fairing (Specialized Construction): This fairing was specially built to help launch the Bigby Orbital Workshop. New Experiment - Gravioli Wave Experiment: You'll need a DenEye telescope and Bigby Solar Observatory along with a MOLE lab to look for gravioli waves in the cosmos. All configurable parts now require an Engineer to reconfigure instead of a mix of Engineer and Scientist. With Pathfinder installed, the DenEye can also perform geo surveys just like the T.E.R.R.A.I.N. in addition to generating ScopeTime and its built-in ground surveillance experiment. It will consume ResearchKits in the process. Added support for Classic Stock play mode and Pristine mode. CRP is now a separate download. Changed OMS Kit's default template to Monopropellant storage. Revised the OMS Kit's description to help players understand its use. Changed Coach's default template to ResearchKits. Science storage templates now unlocked at Space Exploration (when you get the M.O.L.E. station part). Experiments list what parts they require. The Brumby can now be upgraded for unkermanned flight. Reminder: The O-2 "Oxygen" motor and the OMS Kit can both serve as Launch Escape Systems. Test Bench - Test Bench now calculates the simulation costs based upon breakable parts, not all the parts in the vessel. - Test Bench lists both initial and integrated Reliability, both before and after purchasing a Reliability upgrade. - Test Bench lets you add 1, 5, and 10 points of Reliability at a time, with appropriate cost increases. - For KCT users, the VAB/SPH BARIS button will show what the vessel's reliability will be after construction. Escape Pods - Removed escape pod flag from ModuleQualityControl; it was causing confusion. Part Failures - Messages are now displayed in the correct sequence during a staging event's critical failure. - Added new Settings option to give parts the option to potentially explode during failures. It is off by default. They can explode during failed staging events and during post-launch critical failures when the part has run out of MTBF. - Added new Settings option to control how likely a part will explode during staging events. - Added new Settings option to control how likely a part will explode during a post-launch activity when the part critically fails and is out of MTBF. - Critical failures are less likely to happen during post-launch activities. - Revised engine failure modes: shutdown (75% chance unless engine can't shut down, in which case it explodes); stuck on (20% chance unless engine can't shut down, in which case it explodes); explode (5% chance). - Increased the maximum number of seconds in which to make a staging check. - Fixed persistence issues with broken parts. - Crew will no longer try to escape an unkermanned vessel. Event Cards - The available event cards now depend upon the current game mode. Although BARIS is bundled with MOLE, you now have the option to remove BARIS if desired. Simply delete the 000BARIS folder if you don't want its functionality. DO NOT DELETE the 000ABARISBridgeDoNotDelete FOLDER! That plugin is the bridge between MOLE and BARIS. Recalibrated templates for Cryo Engines. Removed deprecated Titan II part. When I began working on M.O.L.E. in late 2014, I had the idea that your early space stations would wear out and require maintenance and/or replacement. I've finally realized that vision with BARIS. You can think of BARIS (the name is a nod to Buzz Aldrin's Race Into Space) as a highly customizable Dangit-lite combined with vessel construction and event cards. Don't want your drills or converters to break? Don't want the hassle of parts wearing out? Do you prefer not to send Equipment up to repair your parts, or to requrire specific skills to repair them? No problem! All that and more are options. As always, It's Your Game, Your Choice. BARIS IS OFF BY DEFAULT! You'll have to opt-in via the Settings->Difficulty->BARIS tab. With BARIS, your space station parts now have wear and tear, which is indicated by the part's Quality rating. They're unlikely to break during their normal design life, but they can start to break down after you exceed their design life. If you perform maintenance on them, you can reduce the chance that they'll break. A broken drill or base part won't function, which can be either annoying or life threatening depending upon the mods you have installed. Once you fix the part, it will continue to function, but its design life will be reduced- unless you disable that option. Recompiled plugin for KSP 1.3. You can convert Equipment into MaterialKits in the 3D Print Shop. Fixex KNUTS experiment to require Plants, not Mulch. Minor update to consolidate ASET/RPM ModuleManager patches into one file. Fix for IVA screens not remembering what image they were displaying. New Part - S.A.F.E.R. : The Safe Affordable Fission Engine with Radiators generates ElectricCharge for your spacecraft needs. It is based upon the real-world SAFE - 400 reactor created by NASA. 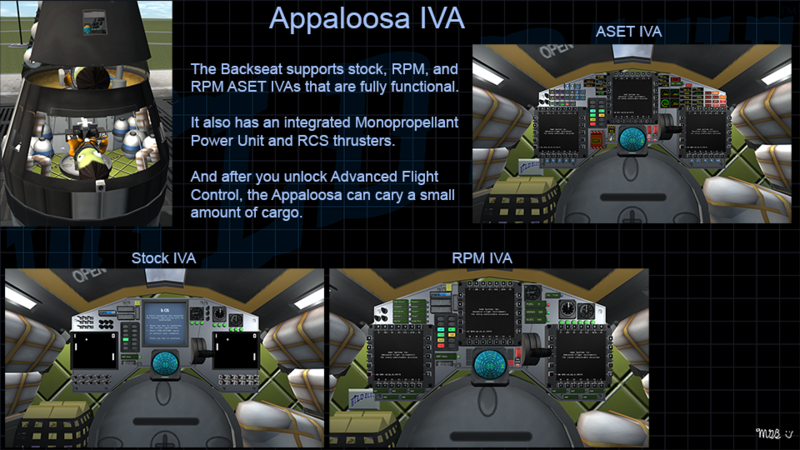 Bug Fixes & Enhancements - Adjusted the Appaloosa's Science template to become available after unlocking Space Exploration. - Removed redundant experiment manifests from the Backseat Crew template. - Refactored TAC-LS converters to use continual production. - Replaced sample craft files. - Deprecated Titan II parts. Restricted the number of contracts that are offered and/or active. Fixed a situation where experiments weren't registering as completed. Contracts won't be offered until you've orbited the target world and have unlocked the proper tech tree. Contracts that must be returned to the homeworld must be landed or splashed. 1.5.0 LDEF: Long Duration Exposure Facility This release introduces an alternative method for conducting MOLE's station experiments in the form of LDEF Experiment Modules. There are a number of these external experiment modules to choose from. Simply fly an experiment to the station (or fly stand-alone using the support modules), start the experiment, and make sure that all the pre-requisites are met. Once the pre-requisites are met and the experiment has accumulated sufficient LabTime and/or other required resources, then either return the experiment module to Kerbin or transfer the data to a Mobile Processing Lab for further processing. YOU CAN USE THE EXPERIMENT MODULES WITH THE MOLE LAB! Remember, the MOLE Lab can generate LabTime even when there are no experiments loaded into the lab. The experiments run exactly like the existing ones; you need to make sure that the experiment's requirements are met (orbiting, specific altitude, etc.) Some experiments might require additional resources or additional parts to be on station. You generate LabTime using the MOLE Lab/LDEF Science Processor, ScopeTime using the KH-10, Plants using the Mark One Botany Lab/LDEF Botany Module, and SolarReports using the Solar Observatory. The existing MOLE science system remains unchanged; you still load experiments into containers like the Coach and Appaloosa, transfer them into the MOLE Lab/Skylab, run them, and transfer completed experiments back into a container for the trip home. The LDEF system simply provides a more intuitive interface for conducting experiments at the cost of increased part count and reduced convenience. You can find these parts in the new LDEF tab. LDEF Core: This part is designed to host up to 4 External Experiment Carriers and/or support modules. You can place the core and its experiments in the Mk1 Interstage Service Compartment, RPND-A Service Compartment, Kargo Bay, or any other part capable of holding the rack and its experiments. Hint: The Mk1 Iterstage Service Compartment can hold up to 3 cores, for a total of 12 external experiments and support modules. LDEF Double Core: A double-sized version of the core. LDEF Tripple Core: A tripple-sized version of the core. LDEF Experiment Module: This module houses a single experiment found in the MOLE science system. There are a number of different experiments available, each with its own module. You can press the "Show Synopsis" button to get a description of the experiment and a complete list of its requirements. Simply press the "Start Experiment" button to start the experiment, and check the status field to see what's going on. To stop the experiment, press the "Stop Experiment" button. When completed, the experiment will automatically show you the results and send you an in-game mail. LDEF Command Processor: This module is a no-frills probe core. LDEF Science Processor: This module generates a small amount of LabTime per day at the cost of ResearchKits and ElectricCharge. LDEF Botany Module: This module grows Plants from Water and Fertilizer at the cost of Water, Fertilizer, and ElectricCharge. LDEF Solar Battery: The solar battery powers your experiments and support modules. LDEF Resource Container: This container holds a small amount of ResearchKits or other useful resources. LDEF Equipment Container: This container is hollow and lets you attach small items. New Contracts - You can run LDEF experiments for Science, Rep, and Funds! The payout is proportional to where the contract asks you to run the experiment. Bug Fixes & Enhancements - Updated the Snacks converters to the latest standards. - RealPlume updates. Thanks DStall & Merkov! - Bug fixes for determining when an experiment has accumulated sufficient resources. Fixed scalar issues with the RPND-A Service Compartment. Fixed angle snap issues with docking ports. Retextured the docking ports slightly; there's an alignment stripe to help you tell which way is up. Fix for Coach's CommNet transmitter. Coach 500 dry mass is now correct. Fixed an issue where the Snacks greenhouse configuration would appear even when Snacks wasn't installed. New Parts - WB-3 "Hemi Cuda,": a variant of the WB-2 that has a shorter nozzle for better use with landing craft, and has a higher initial thrust and ISP. It has Standard (1.875m) and Compact (1.25m) engine mounts and shrouds, and it can be surface-mounted. - WB-4 "Sledgehammer": This is a powerful 1.875m solid rocket motor that initially generates 900kn of thrust in a vacuum. It can be upgraded to 1200kn at Heavier Rocketry, and 1500kn at Very Heavy Rocketry. Bug Fixes & Enhancements - Fixed MOLE's Experiment Lab to generate LabTime properly; a 5-star scientist can push the lab output to 21 units of LabTime per day while a 0-star scientists generates the normal 6 units of LabTime per day. - Simplified the production chain for TAC-LS to use Waste in place of Fertilizer. Re-oriented the Solar Battery arrays to start vertical instead of horizontal; easier to put fairings around them that way. Added the RPND-A Service Bay, a 1.875m service bay. Fixed staging issues with the heat shields. Added a data transfer utility to the science labs. The S.A.M.E. experiment now properly requires SolarReports. Templates require MaterialKits instead of Equipment if MKS is installed. Removed duplicate Mk1 Radial Docking Port. Fixed part upgrades on the Corvette. Fixed specular color on the Fulcrum. Increased gimbal responsiveness on the Fulcrum. Updated Korona Lite drag cubes. The WB-700 has the ability to toggle its decals once again. Fixed test subject conditions on the Interstage Adapters so that you can complete part test contracts. 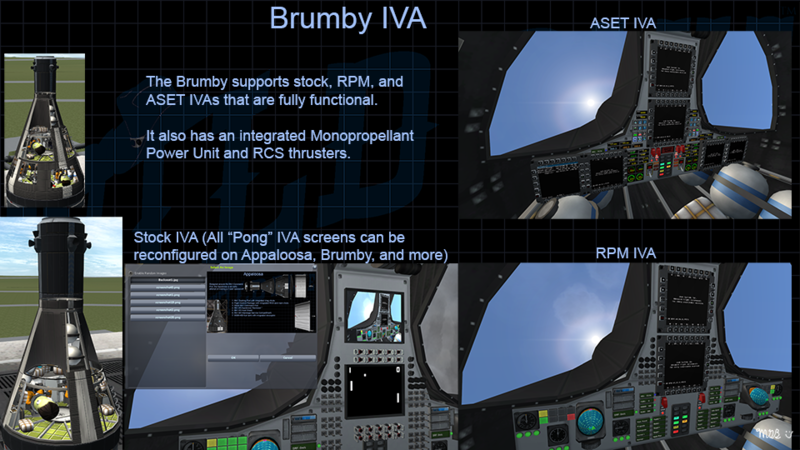 Added heat conductivity and body lift to the Backseat and Brumby to bring them up to KSP 1.2.1 standards. Added charring modules to the heat shields and Korona Lite to bring them up to KSP 1.2.1 standards. Increased max temp on the Brumby and Appaloosa. This is a temporary measure. NOTE: Still investigating why the Brumby and Appaloosa continue to overheat. It appears to be due to the capsule's length not being protected by the heat shield. Increasing the diameter of the colliders helps but they stick out and cause drag. New Parts - Added the Solary Battery Module. Available after unlocking Advanced Electrics, it is a 1.875m part that has a dual-axis solar array and a set of batteries. - Added the WB-2 Corvette Liquid Fuel Engine. The Corvette has two engine mount sizes: Standard (1.875m) and Wide (2.5m), along with corresponding shroud sizes. It can be upgraded to improve its thrust and ISP. Bug Fixes and Enhancements - Removed deprecated versions of OMS Kit and ISC. - The Fulcrum gimbals its thrust properly again. - The Bigby Orbital Workshop can create new experiments again. - Cleaned up some logging issues related to missing part modules and textures when supported mods aren't installed. - Minor corrections to MOLE's KSPedia. - The Brumby can now transfer all the science data from various experiments into the capsule. - For MOLE's docking ports, added the ability to enable/disable angle snap, and the ability to set the snap angle. - If a targeted docking port doesn't support angle snap, then angle snap will automatically be turned off on the active docking port. - The Coach can now be configured as a CommNet center. This configuration is available after you've unlocked Electronics. You can no longer transmit bonus science when CommNet is enabled and you don't have a connection back to Kerbin. You can weld ports from EVA. Stretched the Interstage Service Compartment (ISC) so that it can host the stock SC-9000 Science Jr.. It will only be available to new vessels. Stretched the OMS Kit to better fit the new ISC model. Storage capacity is now increased to match the Buckboard 2000. There's just enough room on the aft end of the OMS Kit to attach a Mk1 docking port. Added the Mk2 Docking Port, a 1.25m docking port that can be welded. It is compatible with the stock Clamp-O-Tron. Fixed issues with docking ports not docking properly. The Solar Observatory functions as a probe core again. Added collider to the Interstage Service Compartment's crew tube. Slightly widened the 1.875m heat shield collider and 2.5m heat shield colliders. Cryo Engines - Titan tanks and wet workshops can be upgraded with zero boiloff technology. ISC - Updated RCS thrusters to newer part modules. Upgrades - Many parts now have part upgrades. Redecorating & Converters - For the modules that used to require Engineers, now any class that has the ConverterSkill qualifies to reconfigure modules. For modules that used to require Scientists, now any class with the ScienceSkill qualifies to reconfigure the modules. Ditto for converters. - Fixed an issue where the Glykerol Lab would despawn the IVA. Greenhouses - Growth time is no longer reduced based upon experienced Scientists. Yield is still affected by experience though. - Greenhouses now show where they're at in the growth cycle. - The MOBL's Botany Lab now produces Plants from Dirt, Mulch and Fertilizer; Water is no longer required. Station Experiments - Updated science defs. Thanks DStaal! :) - Added experiment slots to the Backseat's Crew configuration, and increased the experiment slots in its Science configuration. - Creating new experiments now requires a connection back to Kerbin. - The stock Experiment Storage Unit can now store a station experiment. Other - Added KSP's new part categories to the BOW's list of categories for OSE Workshop. - The Bigby Crew Module's RCS thrusters fire properly now. - Fixed crashing issues with experiment manifests. - Added transmitters to the Station Hub and Solar Observatory. - The 1.875m Titan Fairing now has truss attachment nodes. - Moved parts to the new part categories. - Moved game settings to the Wild Blue tab in the Game Difficulty screen. NOTE: Parts in the Deprecated folder have been removed. Be sure to retire older vessels that use the deprecated parts, or copy the Deprecated folder from a previous version of MOLE. Station Experiments - Added the Ice Cream Research Experiment. - Streamlined the experiment lab GUI and updated the KSPedia pages accordingly. - You can now transmit results back to Kerbin for 25% of the total science. Only labs offer a transmit option. Recovery remains your best return on investment. - The Space Adaption Study, Power Tools Evaluation, Orbital Construction Techniques and Crystal Growth Experiments can now be run in orbit around any celestial body. If you have suggestions for experimental results text for other celestial bodies, I'm all ears. :) - Added Minmus to the list of worlds that you can conduct the Surface Construction Study on. - Added missing SunExposure requirement to the Solar Activity Monitoring Experiment. - Experiments can now be created in the field by some labs. To that end, experiments have the option to specify what resources they need and how much. If not specified, then a default value will be used that's defined by the experiment lab. - Labs have the ability to restrict the experiments they create based upon a list of tags. Hence experiments may list a set of tags as well. If an experiment has no tags that match the tags required by the lab then it won't show up in the list of experiments that it can create. - Experiments can now require asteroids with a minimum mass. NOTE: Basic and DeepFreeze experiments are now located in WildBlueTools; there is no effect to MOLE users. Bigby Orbital Workshop - Added a description. - Buffed production speeds on the BOW's templates. They take a lot but proportionally give a lot in return. - The BOW has a new Skylab template (now the default configuration) that lets it simultaneously become an experiment lab with 8 experiment slots and a Mobile Processing Lab with better capabilities than the stock MPL. - If you have a skilled Scientist aboard, and have resources, then the Skylab can create new experiments to research from the list of possible experiments. 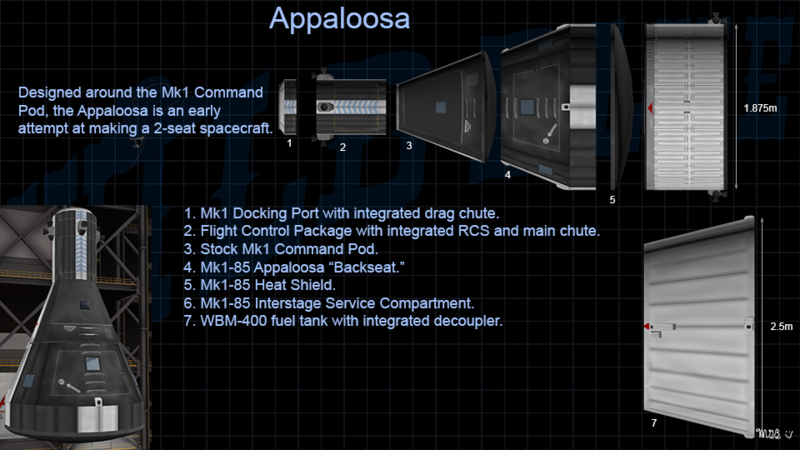 In KSP 1.2, the lab will also need a connection back to Kerbin to recieve instructions Apollo-13 style. For Science! - The BOW's Pathfinder template support should show up properly now. You'll need Pathfinder 1.0.0 or later for the templates to work properly. Botany Lab - The MOBL can now participate in Pathfinder's resource distribution. Bug Fixes - The experiment manifest for the experiment containers works again. - If your framerate drops when using MOLE parts, you can try using the new MM_Placeholder ModuleManager patch located in the WildBlueIndustries/MOLE/ModuleManagerPatches folder. Simply rename MM_Placeholder.txt to MM_Placeholder.cfg. This will swap out the internal spaces with placeholder spaces. Your crew portraits won't look as nice but the game won't have to render detailed internals either. 1.0 Lunar Command (a.k.a. Moonbase) It's been a long haul to get here but MOLE is finally Core Complete! I've finally reached my original vision for the mod as a parts pack for early space station construction. It's gone through many changes, such as focusing on the 1.875m part diameter that's evolving into a modder's favorite, and providing optional support for Pathfinder- something I didn't originally intend. Core Complete means that MOLE has the minimum amount of parts, functinality, and polish to become a viable product release. Hence, expect to see the MOLE thread moved to Addon Releases. Thank you to everybody who helped test MOLE, provide feedback, improvements, and contributions to the pack. Without your help, MOLE would be in much worse shape. There's more to do! The Botany Lab will be receiving a cryopod IVA- if I can pull that off. I hope to have that done before KSP 1.2. And I'm looking at a Brumby equivalent to the Winged Gemini instead of yet another X-20 (which was canceled in favor of MOL). I'll be taking a second look at a deployable parafoil; I already have the basic code designed, but the concept needs refinement to fit into the game. And there's a possible 0.675m engine and maybe some Falcon-9-like landing legs sized for 1.875m parts. These may take awhile, I've got some work to do on my other mods. New Parts - Added the SPF-4 Solar Array, a non-retractable solar panel similar to the panels found on the real-world Apollo Telescope Mount. - Added a 1.875m Battery Module. It holds 2,500 electric charge. - Added the OMS Kit, a combination fuel tank, engine, and storage module that fits inside the Interstage Service Compartment. - Added a Monopropellant Power Unit. Like the stock Fuel Cell, it generates ElectricCharge, but by consuming MonoPropellant. - Added a 3.75m in-line radiator. It is based upon Skylab's aft-mounted radiator panel. - Added the Bigby Instrument Unit. It is a 3.875m diameter probe core/SAS unit that is similar to the Titan Instrument Unit. - Added the Bigby Solar Observatory. It generates SunExposure when it has line of sight to the sun. It can easily support stars from other mods. - Added the 3.75m Bigby Orbital Workshop. This kerbalized wet/dry Skylab analog represents the industrial portion of MOLE. It has templates for making Equipment (Tinker Shop) and processing asteroid resources (Rockhound). It supports OSE Workshop (Craftworks), Extraplanetary launchpads (Smelter, Partshop), and of course Pathfinder (Pathfinder geolab, Pigpen, Sunburn, Solar Flare, Watney, Brew Works, Ironworks, Nukeworks). Station Experiments - Added the Solar Activity Monitoring Experiment. It requires SunExposure and LabTime. - Removed Glykerol requirements for cryogenic experiments. - You will now see the stock experiment results screen immediately upon completing an experiment. That way, you can recover the lab to get the science rewards. You can still transfer an experiment to another part (Coach, Appaloosa, Korona, etc) and recover that part for science. Power Module - Increased the EC output to 5 EC/sec. Combined with a slight increase to its MonoPropellant storage, the Power Module will last about a day (6 hours) at full output. Command Pods - Added support for Kerbal Engineer. KSPedia - Added KSPedia entries for MOLE. I'm open to suggestions about additional entries. RealPlume - Added support for RealPlume. Thanks for the suggestion and tips, Nightside! :) KNOWN ISSUE: Currently the O-2 and the OMS Kit engines use stock plumes. I haven't figured out how to make RP work with these engines. Bug Fixes - Fixed an issue with the Korona Lite bouncing off the water. Don't splash down too fast though, it might sink. New Part - Added a 3.75m Interstage Adapter. It can host up to 7 1.25m engines. Bug Fixes - Fixed RT Module Manager patches. - The MOH has its USI-LS recycler again. - Experiments can require multiple parts for real this time. - The MOH and Botany Lab's light strips now glow properly. - The MOLE Commercial Science Lab GUI should properly show up now when Pathfinder is installed. Fixed NREs generated when converting a storage container into a science container. You can now specify multiple required parts for experiments. The MOLE can transmit its bonus science again. Part mass is now correctly calculated. The Korona can hold KIS items again. The MOLE can now be configured to produce Glykerol. The KH-10 plays nice with CactEye and Tarsier. New Parts - Added the Mark One Botany Lab (MOBL). This research lab can produce Plants for research experiments. With sufficient tech researched, it can also become a greenhouse (a life support mod is required; it supports Snacks, TAC-LS, Kerbalism, and USI-LS). The Botany Lab can be a wet/dry workshop as well. - Added the KH-10 "DenEye" telescope. It generates ScopeTime for experiments, and has a built-in Celestial Body Research experiment for making observations. The KH-10 can integrate with the CactEye and Tarsier telescopes mods as well. - Added the KH-10 Processor Socket, designed to fit CactEye processors. It's only available when CactEye is installed, and fits well in the 1.875m ISC. - Added the KH-10 Control Module. Attach this to the scope on the side with the mirror, and you can use it to point the scope at desired targets. - Added the 1.875m x 2m Kargo Bay. - Added a 0.625m decoupler/separator. You can surface-attach the decoupler/separator. - Added the 0.625m Korona Lite return canister. It can hold a single experiment as well as experiment data. It has a built-in parachute and heat shield as well as a no-frills probe core. MOLE - Increased max data storage capacity to 300 in the MOLE MPL. - Increased the bonus science for the MOLE experiment lab. Station Experiments - Added the Botanical Research Experiment. It requires Plants and LabTime. - Changed the KNUTS experiment to convert ResearchKits into Mulch to avoid confusion when USI-LS isn't installed. Bug Fixes - The Fulcrum engine should gimbal properly now. - Fixed an issue where resources required by experiments wouldn't be accumulated. - Fixed an issue where the greenhouse would automatically declare failure upon first start. - Fixed an issue where SAS modules weren't upgrading properly. SD-18 & SD-25 - The Adapter/Decouplers can now become separators. Other - If fuel tanks are arrayed symmetrically, you'll no longer be able to reconfigure them. It's either that or let the game explode (ie nothing I can do about it except prevent players from changing symmetrical tanks). Fixed an issue where the Korona did not have KIS storage. All Titan & Konan tanks can now participate in Pathfinder's resource distribution system. Added the Mk3-75 Drydock. Like the Mk1 Drydock, the Mk3-75 requires Extraplanetary Launchpads. NOTE: If you have Pathfinder installed, you won't see Pathfinder's Stockyard250 or Stockyard375. Added the Korona Supply Capsule. Based upon the stock Mk1 Command Pod, the Korona ditches the kerbal in favor of cargo, probe core, and associated avionics. As a science canister, it can carry two experiments. Fixed a template issue with CryoEngines. Station Light - Reduced research cost and price to be in line with stock lights. - Moved tech node to Electrics (same as stock lights). MOH - Added TAC-LS recyclers to the Dolores Habitat configuration. - Renamed the Life Support converter (required for the KNUTS experiment when USI-LS is not installed) to KNUTS Processor. Bug Fixes - Fixed an issue where players could not transfer crew out of a wet workshop that has been converted into a habitable module. - Fixed an issue where, if you have Pathfinder installed, reconfiguring the MOLE/MOH would not honor Pathfinder's settings for requiring resources and the proper skills to reconfigure the module. Fixed an issue where the Interstage Adapters required staging to complete. Station light won't throw NREs when in the VAB/SPH if turned on. MOLE is getting closer to Core Complete! This release adds new parts including the Mark One Habitat. New Parts - Added the WBM-700 fuel tank, a 2.5m fuel tank that has a crew tunnel through its center. - Added the IA-25, a 2.5m Interstage Adapter. It's just like the IA-18, only bigger. Its central node is setup for 1.25m parts while its outer nodes are ready for 0.625m parts. - Added the Titan 2.5m Decouplatron, a 2.5m version of the 1.875m Titan Decouplatron. It can be a decoupler or separator. - Added the SPF-4 Solar Array, a large deployable solar array that's available sooner than the more capable SPF-8. The SPF-4 cannot be retracted, and it cannot track the sun. It is inspired by solar panels found on Skylab. NOTE: For symmetrical part installations, be sure to mirror the panels so they face the desired direction. You can do this by right-clicking the part and pressing "Mirror Panel." - Added the Mark One Habitat (MOH), a 1.875m habitat that sleeps 2 kerbals. It provides recycling capabilities depending upon the life support mod that you have installed. It has a Dolores Habitat configuration and a Wet Workshop config (that holds LiquidFuel/Oxidizer). With Pathfinder installed, the MOH can also become a Pathfinder Geology Lab, Ponderosa, and Pigpen, albeit with reduced capability due to its smaller size. Titan II Tanks - Renamed the Titan II line of tanks to the Konan tanks, in honor of the proposed Titan Barbarian. Station Experiments - Added the Kerbal Nutrition Utilization Transfer Study (KNUTS); it requires a Mark One Habitat, Mulch, and LabTime. Fixed an issue where the Bonus Science tab would break the MOLE Operations Manager in the VAB/SPH. Fixed an issue where the light switch wasn't available in the context menu. Fixed an issue where the MOLE Lab couldn't generate bonus science when there were no experiments in the lab. Science System - Experiment Manifest and transfer screens now list the part they're associated with. - Fixed an issue where experiment info wasn't showing up in the VAB/SPH. - The Load Experiment window now appears slightly offset from the Manifest window to make it easier to distinguish that you're now loading experiments into the part. - The Transfer Experiment button now makes it more clear that it is a transfer experiment button. - In the VAB/SPH, the Experiment Manifest will show a new "Load Experiment" button. - You can now run/pause individual experiments. - Additional MOLE Labs can contribute to a lab currently running experiments as long as the extra labs don't have any experiments running. - Experiments now individually keep track of the resources they consume during research. - Added clarification to the MOLE Lab operations manager to make it clear that you will gain bonus science and generate LabTime independently of any running experiments. - The Experiment Lab will no longer stop if it, say, runs out of resources or the part doesn't have enough crew. - Improved rendering performance of the experiment windows. - Previously occupied experiment slots properly report as empty after the completed experiment's final transfer. - After the final transfer, experiments will show their results (via the stock experiment results window). - Added the ability to send an in-game email if the MOLE Lab suffers a catastrophic failure during research (assuming you have the "Parts Can Break" option set). - Added the ability to specify whether or not parts require resources to fix and/or parts can break. Currently this only applies to the MOLE Lab. - MOLE Lab repairs are working properly. Updated the science defs in the existing experiments. Added Temperature Study, Thermal study, and Surface Construction Study, courtsey of the DStaal Institute of Technology. NOTE: Play balancing still needed! Help balance the cost/rewards of the experiments. NOTE: Due to the increasing number of experiments, you might want to lower your science rewards for your game. Power Generation - Decreased consumption rates on the MPUs. They'll last longer now. Bug Fixes - Fixed an issue where experiments wouldn't show up after reloading a craft. - Fixed an issue where upgradeable SAS units weren't upgrading.